Students for Life of America, the nation's largest pro-life youth organization, celebrated victory at the Miami University of Ohio Friday after school officials settled a federal lawsuit in which they agreed to no longer require a "trigger warning" for pro-life speech on campus. 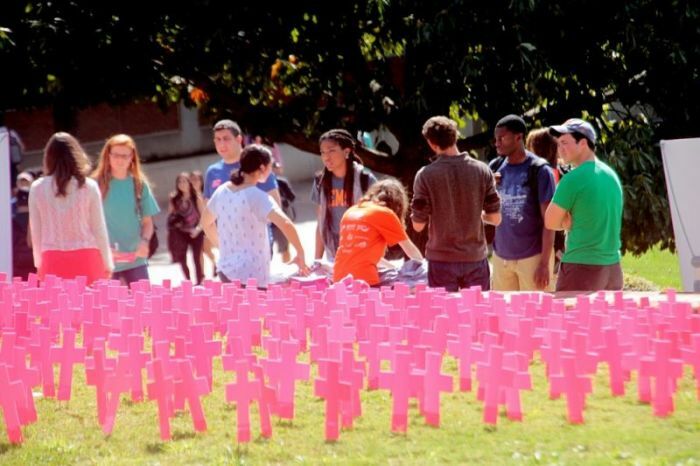 The settlement comes in a dispute that began last October when university officials told members of the campus Students for Life club that they would have to post "warning" in front of their display of 300 crosses which highlighted one cross for every 1,000 abortions conducted by Planned Parenthood in 2017. President of the Students for Life Miami University of Ohio campus, Ellen Wittman, reported that a school official told her the warning sign was required due to concerns that the pro-life display could cause "emotional trauma" for those who might view it and she wished to help possible trauma victims "better protect and manage their emotional reactions to the display." The official further suggested that the group consider "less harmful" ways of expressing its pro-life views. With the help of nonprofit legal organization Alliance Defending Freedom, Students for Life filed a federal lawsuit last November challenging the university's policies that give officials broad powers to determine whether an exhibit can occur and what it can say. With the rollback of the "trigger warning" requirements, Kristan Hawkins, president of Students for Life of America, praised the ADF and the students for working to secure free speech rights on the campus. "This is a victory for the free speech rights of students, who should not be told that their support of mothers and their preborn children is some kind of shameful act that should be apologized for or vilified as harmful," Hawkins said in a statement to The Christian Post Friday. "We appreciate the work of Alliance Defending Freedom, and especially love the commitment of our student leaders who courageously advocate for life, no matter the obstacles." She further added: "A tragic national trend in violations of student free speech rights is developing nationwide. But our courageous student leaders show every day that they care more about preborn infants and women than with an easy college experience by continuing to speak up for life, no matter what." Along with no longer requiring trigger warnings for pro-life speech, the ADF said the university also "agreed to revise a third policy so officials cannot stifle speech simply because it could 'cause alarm, annoyance, or nuisance.' The university has also agreed to pay Students for Life's damages and attorneys' fees." "We commend the university for quickly recognizing that its officials do not have the authority to censor student speech simply because of how someone might respond to it," ADF Legal Counsel Travis Barham said. "By revising its policies to respect students' constitutionally protected rights, the university has fostered the marketplace of ideas that public universities are supposed to be. After all, the only permission slip students need to speak on campus is the First Amendment, and they cannot be forced to post 'trigger warning' signs simply to share their ideas."